Last week someone asked me as a long married man what I thought of gay marriage. I said I was all for it; it was straight marriage I sometimes have my doubts about. I was joking, but like most jokes there was a kernel of truth in it. With the rate of divorce in this country at a record high level I wonder how the right wing keeps their self-righteous rhetoric going on the sacredness of traditional marriage, and why it feels so threatened by gay people who want the ceremony, the respect, and the legal rights of marriage. The denial of those rights seems outrageous in any country that considers itself a civil society. And there is the embarrassing fact that Republican John McCain, Libertarian Bob Barr, and half the Republicans and Democrats in Congress are divorced or serial adulterers, not counting those defenders of marriage who are lusting after Senate pages, and engaging in toilet booth toe tickles. Yes, I do believe in defending marriage but not by setting up walls of discriminatory law to prevent others from enjoying its privileges, its joys, and its struggles. A few years back when many people mocked or condemned Hillary Clinton for staying married to Bill after the Monica mess, I thought it was among her bravest decisions. She would not let scandal or humiliation, a relentlessly prurient press, or a husband who was half a genius and half a jerk force her to end a marriage that for all its flaws meant a great deal to her and to her daughter. There was a better history to that marriage that she was not going to toss out to satisfy her critics during the impeachment. Marriage can be a litmus test for how a person might govern. 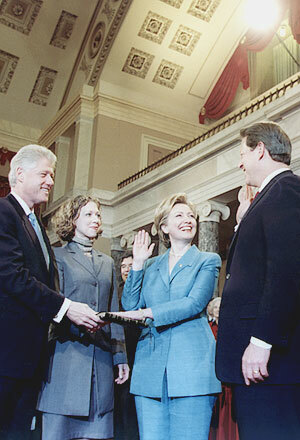 Bill’s screw up within his marriage was not totally disconnected to some of his bad Presidential decisions, including his pardon of Mark Rich, and his embrace of NAFTA; suggesting immediate gratification without a thought of the consequences to his own reputation or to the nation’s workers. Then look at the Bush marriage. Laura and George existing in separate worlds even as they inhabit the same space; the sad disconnect of a cheerful looking couple who have only one thing in common, an inability to face the facts: George, in his constant losing battle with reality, Laura smiling her ladylike library smile from one denial to another denial about the toxic consequences of her husband’s presidency. I might even contrast Obama with John McCain, whose marital history shows a streak of cruel opportunism, suggesting a man who will always abandon his principles and the welfare of the disadvantaged, as he abandoned his first disadvantaged wife when it proved expedient. Having said that I have to step back a little for nobody, and that includes this writer, has the right to pass too harsh a judgment on other people’s loves and marriages, which doesn’t mean that I don’t do so from time to time. What I do know is that marriage is occasionally an arrangement, sometimes a marvel, often a mess, and always a mystery. I have observed that love ties us up in its amazing contradictions and confusions, and never more so than in a marriage.